"True Multiple Monitor" is supported by Thinstuff XP/VS Server, which means that remote-desktop-sessions can be distributed across mulitple monitors with high-resolution displays. Since Windows 7 / 2008 R2 Multiple Monitors is supported. The client’s monitors can be arranged in any order with different resolutions. 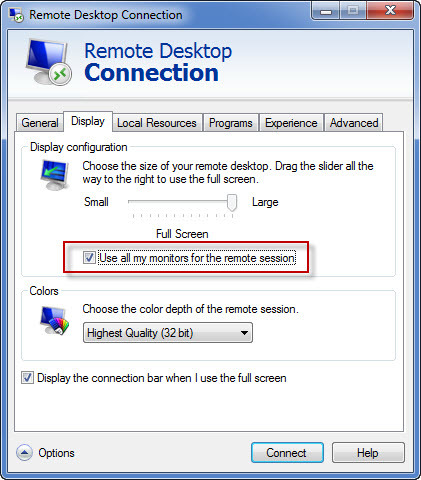 Mulitple monitor mode: "mstsc /multimon"
As alternative you can install our own, free RDP-Client TSX RemoteApp Connection. Here you can easily enable the function for multiple monitor mode or span-mode. 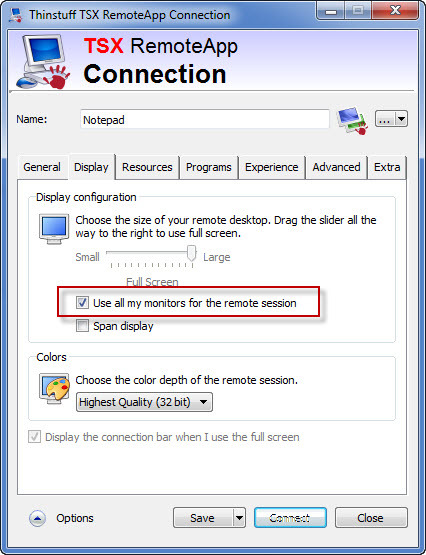 Enabling this feature the remote-desktop-session is displayed in two or more seperate monitors (also with different resolution) and it automatically positions dialogue boxes and windows, so that they do not appear in the middle of the two monitors. Will span the display over the monitors as discribed aboth. How can I add users to the Remote-Desktop-User group in Windows Home OS? How can I add users to the Remote-Desktop-User group in Windows XP? How can I share an USB Device with TSX USB? I have a problem but I cannot find the answer in the FAQ site? Is the XP/VS Server compatible with Windows Server 2000?